Congratulations to Matt Thursfield who mounted a comeback in the second race to secure victory with a three way tie break. 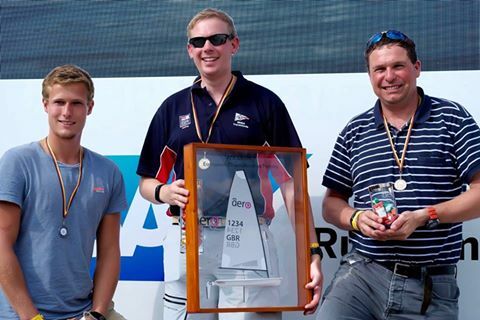 The podium at Blithfield is the same as the RS Aero 9 Europeans, but the order reversed by the tightest of margins! With a big forecast from the north, it was no surprise to see a depleted entry into the 4th Round of the Blithfield Barrel series (races 7 & 8), doubling up as the 6th round of the RS Aero UK Winter Series. On the start line were 6 Aeros, mainly in '7' rigs, with Mark Rolfe playing a wise card with his 5. We were joined on the second start by a menagerie of slower boats, the Merlins et al. disappearing off up the racetrack on the earlier start. The course was an Aero dream, decent beats with a flying reach along the length of Blithfield's water, capped off with a tactical run. Race 1 saw the lead change hands at least 5 times. Rich Watsham, then Matt Thursfield, Ben Rolfe took over, Matt then capsized allowing a Rich and Ben battle to ensue, Rich holding the leader's baton as he crossed the line. 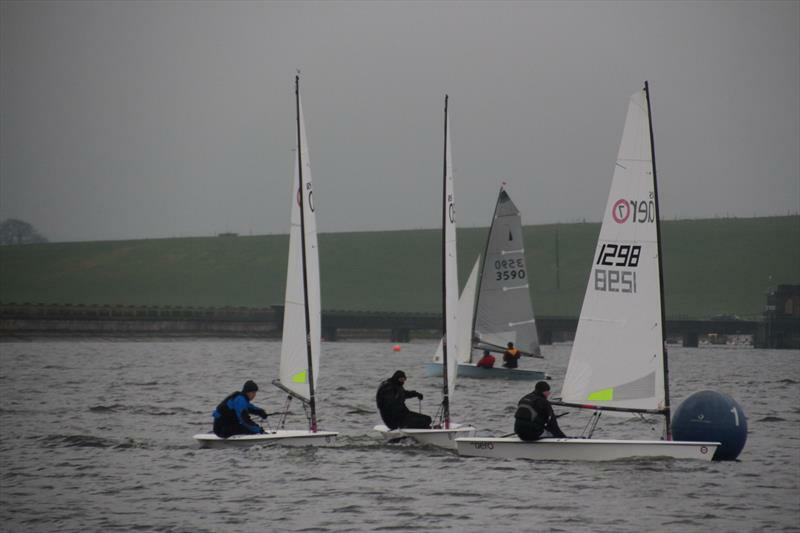 The rest of the fleet had struggled around the course, the gusts at time hitting 25 knots armed with sleet and snow. Dan Johnson trialling the boat for the first time led home Chris Wooley and Mark Rolfe. After a legendary Blithfield lunch, the Barrel fleet made their way back out for race 2. Matt nailed this one from the off. Banged right up the beat and was gone. He again missed out on the fun, Rich and Ben renewing their fight from race 1. This time Ben took Rich, 30 seconds behind Matt. So onto the results. The RS Aeros gave a good showing with 6 of the 37 or so starters. On PY the Aeros had a particularly good second race with 2nd, 5th and 6th between them in he overall placings. Aerowise, it was easy. Each had 4 points. A draw! But the scoring was on position in the whole fleet. Who had it?? Well .. um... no-one!!!! Matt had 11th & 2nd. Ben had 8th & 5th. Rich had 7th & 6th. 13 points apiece. A draw!! Matt's second in the last race gave him lead Aero on tie break...just. That was close, cold but a lot of fun!!! Next up is The Oxford Blue this Saturday 18th, which includes the RS Aero UK Winter Championship. 41 RS Aeros are now signed up. Wrap up warm and come and join the fun! - The RS Aero 9 Europeans podium from 2016 was reversed at Blithfield! l-r; Ben Rolfe, Richard Watsham, Matt Thursfield; by Ants Haavel. - Richard leads Matt and Ben at Blithfield; by Pete Slack.